As rough as they were, I was a pretty big fan of the Budokai Tenkaichi fighting game series that Bandai Namco released for the PlayStation 2 era. It’s been great to watch those tournaments re-emerge in the Xenoverse series with its own twist and online gameplay. 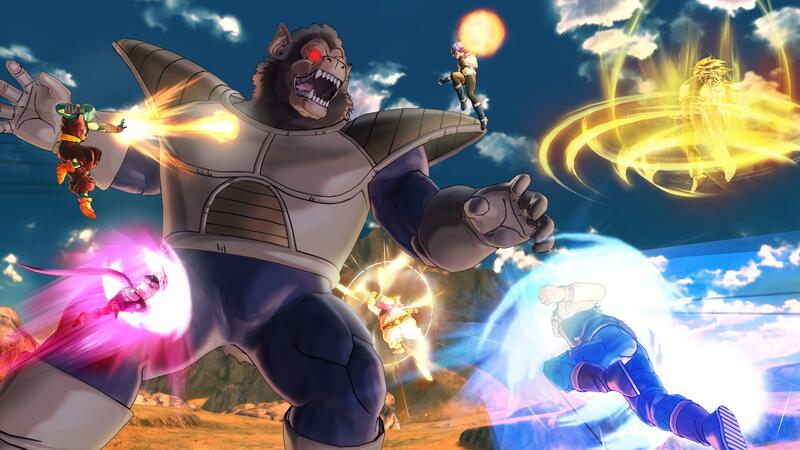 The first Xenoverse title wasn’t 100% successful with its ambitious endeavors, but developer Dimps definitely learned from their mistakes the first time around. The online game mechanics are incredibly sound; however, the Time Patrol plot device has returned, removing any real newness the game has to offer. In many ways, Xenoverse 2 is a 2.0 upgrade for Dragon Ball Xenoverse and not a proper sequel. Canton City has had a few upgrades since the first go around. Sure, your Dragon Ball Z-crafted character still can’t fly from the start, but now you can summon a vehicle at any time to help get you from point A to point B far faster than running around. There are also more stores available to additionally customize your character, including equipment, outfits, and of course, various skills to improve your prowess on the battlefield as well as tailor your character’s fighting techniques to your preferences. The City is once again a hub world for your various missions as a new recruit on the Time Patrol. You can take these missions in almost any order you want, although it’s heavily emphasized that you take them on in a difficulty order so you can build up your experience, earn Zeni and medals to buy equipment, and learn new skills from various DBZ masters a.k.a. famous characters from the show and movies. There are plenty of side quests and Parallel Quests you can take to grind for experience, but if you’re a veteran when it comes to fighting games, then you may not need the grind to get new techniques. For novices, however, the grind is a valuable practice tool if you don’t want to participate in offline or online matches. The grind is also the only way you can learn new skills from the DBZ masters scattered about Canton City. They will only teach you their techniques if you’re at a certain level or if you’ve completed certain main or side missions. Obviously, you don’t have to learn their techniques, but at the same time, it is fun to learn a character’s signature attack and use it in battle. For example, take the classic Radditz vs. Goku and Piccolo fight below. What if Radditz was able to dodge Piccolo’s Special Beam Cannon? How could Goku and Piccolo defeat him and save the world? From watching the gameplay video above, you undoubtedly noticed the game’s most glaring problem: the poor lip-syncing with the dub. It’s so bad during the cut scenes, I felt like I was watching an early kung-fu movie dub from the ’70s and ’80s. Trunks’ lips would continue to move long after he was done speaking, which was incredibly painful to watch. At least the visuals are crisp and colorful to somewhat make up for the awful lip-syncing. Just watch the pretty battles, people, and do not look at their mouths as they talk. With all of the side missions, skills to unlock, items to craft, hilarious side quests such as the milk delivery quests, Parallel Quests with co-op capability, offline and online matches, and not to mention the main missions, there is more than enough for players to sink their teeth into. It will feel padded to some, especially those who played the first game. Dimps undoubtedly forced in the RPG-grinding to lengthen the game and separate it from the Budokai games, which does it make more unique, and at the same time, a bit annoying for a title that is, at its core, a member of the fighting genre. Those who never picked up the first title will easily jump into Xenoverse 2 with amazement and wonder and love every minute of it. Those who already played the first game will appreciate the solid online mechanics, but won’t find much motivation in going through a main storyline that they’ve already done time and time again. Dragon Ball Xenoverse 2 review copy provided by publisher. For more information on scoring please see our Review Policy here.